Fort Lee is celebrating another year of culinary diversity with its third annual Fort Lee Restaurant Week! Come join us for a week-long event featuring unforgettable flavors and experiences. 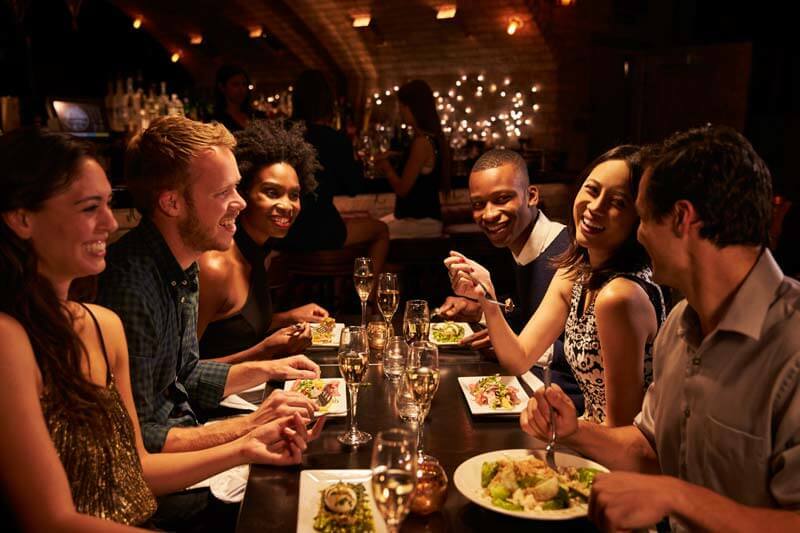 Before making your first of many reservations, learn more about the various types of global cuisine you will encounter during your tasting journey through Fort Lee. Chinese cuisine refers to many different types of dishes due to the way Chinese culinary techniques have adapted around the world. American Chinese, for example, can differ greatly from menu items in Beijing based on locally available ingredients. Typically, Chinese cuisine will feature many colors and aromatic flavors. Chinese dishes also emphasize taste which can be divided into five categories: bitter, hot, salty, sour, and sweet. Each dish will bring one of these tastes to the forefront of your palate. Classic American cuisine focuses on food that is simple and satisfying. Many refer to this type of cooking as “comfort food.” Most American dishes feature staple ingredients such as beef and poultry as well as potatoes and vegetables like a hamburger with cheese, lettuce, tomatoes, and a side of fries. These easy-to-make dishes are popular and widely enjoyed throughout the 50 states. While simple enough to make in your own kitchen, many classic American dishes can be deconstructed to create new ones. For example, instead of baking a chicken pot pie, you could layer the vegetables and sauce overtop a piece of grilled chicken breast to create a different dish with the same flavors. Traditional Greek cuisine centers around slow-cooked, simple dishes seasoned with olive oil and herbs. Rather than marinating in heavy sauce, Greek cuisine remains filling and flavorful, yet also has a unique freshness to it. Though Greek cuisine has changed greatly throughout history, you can expect amazing tastes crafted with sea salt, olive oil, and fresh pita bread. A Greek meal is also not complete without the incorporation of cheese, olives and either a hummus or sauce made from a yogurt base. Far more than just pizza and spaghetti, Italian food focuses on creating bold and satisfying dishes without heaviness. Italian cuisine focuses on merging satisfying texture with fresh flavor. Typical Italian dishes will incorporate items like fresh tomato and herbs, pasta, and olive oil alongside proteins and produce. Because Japan is separated from the larger Asian continent, Japanese cuisine has many unique characteristics all its own. Many Japanese dishes incorporate rice and miso soup – a fermented soy soup commonly using tofu, seaweed, and scallions. Seafood is also very popular, often using raw ingredients like those found in sushi. Japanese chefs utilize many different cooking techniques, such as grilling, simmering, steaming, and deep-frying; allowing everyone to find a type of dish they will enjoy. The diverse range of flavors in Korean dishes stem from the Korean Peninsula’s unique geography containing mountains, fields, and multiple coasts. Distinguishing characteristics of Korean cuisine include spices and the many side dishes that are staples of the diet. Kimchi, a vegetable dish seasoned with various spices like pepper and garlic, is perhaps the best-known example. Another popular dish famous to many Americans is bulgogi, otherwise known as “Korean Barbecue” – a dish of thinly-sliced meats marinated in sauce made of soy sauce, garlic, sugar, sesame oil, and other seasonings that is cooked over a fire. Lebanese cuisine incorporates herbs, spices, and fresh ingredients without relying much on heavy sauces. Common seasonings in Lebanese food include mint, parsley, oregano, garlic, allspice, nutmeg, and cinnamon. Bread, in flat or pita form, is included with almost every meal and is so culturally significant that some Arabic-speaking cultures refer to it as esh which means “life.” Though Lebanese dishes primarily consist of fruits, vegetables, and grains, you can also find plenty of poultry and lamb in Lebanese dishes as well. Southern Cajun cuisine is a rustic cuisine that emphasizes locally available ingredients and simple preparation. An authentic cajun meal incorporates three pots: one for the main dish; one for steamed rice, sausages, or seafood; and the third for vegetables. Cajun chefs also typically includes aromatic vegetables like green bell pepper, onion, and celery and often use meats like crawfish, shrimp, and andouille sausage. Vietnamese cuisine uses many fresh herbs and fish sauce in a majority of dishes. These dishes blend aromatics with hot, sweet, sour, and fish sauce flavors to create impeccably balanced meals. Because of the country’s close proximity to China and its history with France, the nation’s cuisine incorporates many outside influences in its cooking techniques. The banh mi, for example is a vietnamese sub that uses French baguette bread. Many dishes are also influenced by Chinese stir-fry techniques and noodle-based soups. Regardless of what you order, you will enjoy a dish that is fresh, aromatic, and incredibly tasteful.